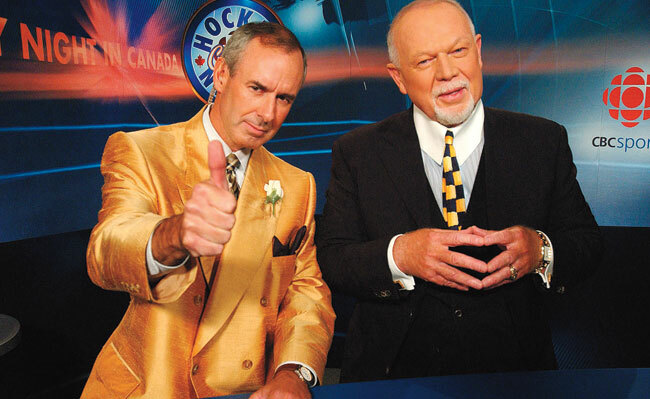 Hockey Night in Canada , with Ron MacLean and Don Cherry at the forefront, is now officially absolutely awful. It has become a joke. I enjoyed working with Ron years ago. Today, he and Don Cherry have been allowed to become horrific caricatures. And the work they are doing is not suitable for a national network. Not even close. This all came to a head yesterday evening, when I sat down to watch Game Five of the Canadiens/Flyers’ Eastern Conference Final. After a mind-numbingly predictable musical tease (the first video you see when the show goes on the air), I could not believe my eyes. MacLean was sitting in a rocking chair, on the ice at Wachovia Center, taping the blade of a hockey stick. Then he began reciting what sounded like a poem. Perhaps it was something he wrote. Perhaps it was something famous that I did not recognize. All the while, he was wrapping the black blade with white tape. I sat there, dumbfounded. The purpose of an opening, to every live television sports producer who ever lived on this earth, is to set the scene for the game. Tell the viewer what the story is. How should they watch the story develop? What key aspects should they keep their eyes on? There is always precious little time to deliver this information – so it requires a great deal of thought and planning to present an opening befitting the scope and magnitude of the game we are about to watch. Simple, but complicated at the same time. This game was huge. It would, possibly, determine which team would face the Chicago Blackhawks in the 2010 Stanley Cup Final. Now, in order to properly critique this disaster-of-a-rocking-chair fiasco, I should have watched it more than once. Just to make sure I saw what I thought I saw. But I couldn’t bring myself to. It was that absurd and obtuse. And the regular viewer only sees it once, so the point better be easy to grasp and process. At the end of MacLean’s piece, prior to the HNIC title animation, he stood up and long-windedly explained that, if they don’t win tonight, Les Canadiens would be spending their time in the chair. It’s apparent what they had in mind, but it missed any perceived mark by about a hundred miles. And the Ron and Don segments continue to degrade into a bad YouTube video. During Saturday’s game, while Ron was interviewing Ken Dryden, the camera panned/drifted over to Cherry, sitting aimlessly in the dark of the studio. From where I was watching, I had no sound, but my guess is that Dryden was referencing Cherry and the oh-so-clever person who was directing the show thought this would be funny. It was moronic. If they wanted Cherry included in the segment, they should have had him wedge his ample ego out of his chair and get on-set. Yesterday, MacLean decided that reading a newspaper, word for word with Cherry, while the paper was obscuring most of MacLean’s face would be good television. MY GOD! This is Canada’s flagship hockey show! Or it was! Now it’s just a friggin’ joke! Too True! These two have become parodies of their former glory. The search for ratings has degraded the show to novelty status. Big Mouth indeed! Another bobble head amongst the talking heads. Bring back Howie Meeker and Peter Puck. To see Don Cherry in a monkey suit is OK but more than once is disgusting. Take him off the air. I completely agree with you! Don Cherry is a little old lady and Ron is his horrific mink stole from 1934! Bring some youth to HNIC! You’re right. Youth is what it’s all about. Time to inject some life into the senior citizen that is HNIC. I hate the political commentary and Cherry’s senile defence of fighting and “the code.” I usually have the TV on mute between the 1st and 2nd periods…. That’s the problem. The rants contain no variety and, while they may actually have some validity, their forum has run its course. They’re better than the alternative. Better than TSN? Are you mad, man? You can’t now but, when TSN does another hockey game, watch the game coverage. Watch how much information is provided. TSN wins by a light year. I think one must view it as pure entertainment! Ron and Don are a welcome fixture on HNC, besides who knows more about the game of hockey! I enjoy Coaches corner more then the game at times. Why must we always try and fix something when it isn’t always broke! When you have been around for as long as Cherry has and walked in his shoes, maybe then you can comment on weather you think the show is crap. But you’ve missed out on the very worst aspect of HNIC: Mike Milbury! Duthie has really impressed this year… knowledgeable, humble, witty without trying too hard (most of the time)… kinda what MacLean used to be. Too bad Ron & Don have been allowed to get where they are today (are the producers not ulitmately to blame here?). Not a problem that’s going to be fixed anytime soon either. Think about it, the majority of HNIC viewers are Leaf fans, and that crowd will stick with a sinking ship as long as any. Couldn’t have said it better myself. Change and HNIC are like oil and water. I was reading something else about this on another site. Interesting. Your point of view on it is polar contradicted to what I read before. Well, did the other opinion’s writer produce the show for five years? I didn’t think so. I don’t know if you actually see responses to old commetaries–but I thought your comments on Cherry and HNIC are dead on. And his recent political rants surely are surely evidence that this guy’s day has long since come and gone. So Don Cherry is an intolerant, homophobic, chauvinistic extremist…who knew? What bothers me most is that the guy is, for a lot of people, even now, the poster boy for the CBC and NHL hockey. That thought sickens me. If I’m running HNIC, I think a long talk with Don would be in order. It’s all a bit trite now, I suppose. The absolute biggest and most defaming aspect to ever “grace” (ahem) a live hockey game came in 2007 on the VS (Versus) Network. The announcers whom I don’t remember by name, were talking about the players’ wives! To add further insult, the announcers were talking about the players’ wives and their respective shopping excursions that day! (It was a home game for the Rangers I believe and I’m recalling, hopefully with absolute certainty, that the talk was about 5th Ave. shopping jaunts and all the wonderful items the ladies had purchased). “Oh, and a shot on net get kicked to the corner” was basically the extent of the on ice game calling that the announcers eluded to between the shopping recounts! As a citizen north of the Canadian border who is VERY fortunate to receive the CBC broadcasts, just please don’t look a gift horse in the mouth. It could be worse.